In this email blast: Vancouver STLHE 2015, Dianne Batemann appointed chair of Publications Committee, 3M National Student Fellows, Roger Moore steps down as editor of STLHE Newsletter, ICED Conference, and an EDC Conference reminder. The countdown is on with only seven months till STLHE opens on June 16th in beautiful Vancouver. Hosted by Simon Fraser University and the University of British Columbia, this year’s conference theme is “Achieving Harmony: Tuning into Practice” and the call for proposals has been announced. Join colleagues from across Canada and beyond in rejuvenating yourselves and your practice amidst the city, sea and mountains — submit your proposal before the midnight (PST) January 16th deadline! Dianne Bateman appointed Chair of the Publications Committee. We are pleased to welcome Dianne to the STLHE Board, (The Board appointed Dianne to complete the term of Catherine Chiappetta Swanson who stepped down earlier in the year). This isn’t Dianne’s first time on the board and her previous experience includes the Publications portfolio and she was the founding editor of CJSoTL. A full list of current STLHE Board members is available on our web site. The 3M National Student Fellowship Award honours up to ten full-time undergraduate college and undergraduate university students at Canadian institutions who have demonstrated outstanding leadership in their lives and at their college or university. Do you, or your colleagues, know of a students that has made such a contribution? If so, visit the 3M National Student Fellows website where you can find information on the award criteria and how to prepare a nomination file. If you have any questions, Heather Smith, the awards co-ordinator will be happy to answer them. The deadline for submitting nomination files is January 12th 2015. ICED (International Consortium for Educational Development). Registration is now open for the ICED Continental Symposium on evidence-based educational development. Or, in the words of the organizers “dive into a range of evidence-based practices across disciplines and professional practice and push the boundaries of development by sharing very diverse perspectives.” Conference dates are June 14th and 15th at the Hotel Grand Pacific Victoria. Why not consider extending your visit out west and attend both ICED and STLHE? Early-bird registration for the EDC annual conference, « Leaping beyond the Evidence » closes December 5th. 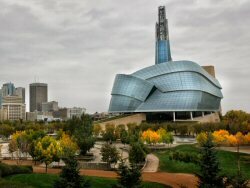 Highlights include: a pre-conference workshop by Dr. Christopher Adams focusing on the “nuts and bolts” of program evaluation, keynote speaker, RoseAnna Schick will talk about creativity and the quest for adventure, and a visit to the new Canadian Museum of Human Rights.